The Gerbera is one of the sunniest and most cheerful looking flowers. It is often used to create get well or feel better arrangements. They can also used to create exciting and fun bouquets for loved ones. The distinctive colorful petal shape makes them easy to recognize. Some species offer a fuzzy appearance due to several layers of petals. Other species offer a more simple appearance in many vivid colors. 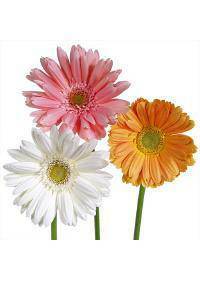 Gerberas are daisies, which are members of the Asteraceae family. It has a bright unique appearance that makes it easily recognizable. It has many names and is found in both the wild and home gardens. The G. Jamesonii is one of the most widely recognized of the species. This is a South African species, and bears large daisy blossoms. Red, yellow and orange are the most common colors found for flowers. Other species often include the name daisy as part of the description. Examples include Ghostly Daisy, Hilton Daisy and Transvaal Daisy. This is common for G. Anandria, G. Aurantiaca and other varieties. Variations have been cultivated that produce white or pink blooms. Some variegated shades have also been produced with several colors. Some bronze shades are another possibility with careful breeding. Gerbera are flowering perennials that have a striking appearance. A thick stem topped with a vivid bloom are the most popular type. There are four main subgroups to the type of bloom visible on plants. Single flower species have a row of petals that do not overlap. The center is often green and the petals do not cover up the eye. Single daisies are the most common for florists and garden centers. Double daisies, known also as duplex, have a double row of petals. These often overlap one another, giving them a different appearance. The eye may be dark red, black or green depending on the cultivation. Crested and full crested varieties are the last two groups of daisies. These feature both outer and inner layers of overlapping petals. The eye may be partially or fully covered by the inner petal layers. This flower is the fifth most popular in the world for its meaning. These are often used to express cheerfulness and happiness to others. Some may use them to show innocence and purity, such as youthfulness. The bright and sunny nature of these flowers makes them popular gifts. Many send them to cheer up others after an illness or an injury. They are also sent as a congratulatory symbol due to their appearance. For some, these are similar to sunflowers, albeit smaller in size. Their symbolism and charm often brings a smile to almost any face. Assortments of gerbera daisies can be found in areas such as Norfolk, VA, Chicago, IL, Santa Clara, CA, Surprise, AZ, Inglewood, CA, and more. They are available in larger abundances during the spring and summer. Some variations, such as deeper colors often have a dramatic impact. Deep red and pinks are frequently used for high drama bouquets. This is popular for proms or weddings as it makes a big statement. Combination bouquets are widely popular for flower girls or tables. Mixed colors may be chosen, or a central color theme such as pink. The daisies may be mixed with other flowers for a more wild look. A single bloom may be used as the focal point of any table setting. This centerpiece is often used for summer cookouts or gatherings. Yellows and oranges are the most popular summer and spring colors. Home gardeners often plant a mixture of the colors and varieties. This provides months of vivid colors with deep green leaves and stems. For this reason, the gerbera is a top choice for any sunny garden.